NOW WITH FREE SHIPPING IN EU ! Luna Speaker UMS-1 is an integrated and mobile active speaker capable of reproducing very broadband spectrum of sounds and ultrasounds. It has independent powering (internal 8 AA cells or external 9-15V) and high efficiency ultrasonic amplifier connected to custom modified ring radiator ultrasonic transducer. Device can be connected to our luring devices like Luna Lure UMP-2 or UMP-1 for widening the beam width (for example: directing ultrasounds in opposite directions on both sides of the net) or to increase the radiated power in a given direction and therefore to increase the range, or by placing the speaker as an additional sound or ultrasound source at some distance from the signal source. It can be also connected to our new LunaDAC-1 (USB-DAC interface) for playback directly from PC / notebook or even tablet. It is possible to maintain virtually loseless transfer of sounds and ultrasounds for a great distance because the signal is low current and it’s more resistant to losses compared to the high current signal from the output of the amplifier to the low impedance transducer. 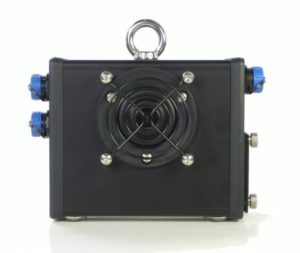 In this device transducer is connected to amplifier via very short low impedance cables inside the enclosure, therefore there is virtually no power loss (or, to be exact: no noticeable/measureable losses) in the signal cable. The relatively high power of the ultrasonic amplifier makes it possible to correct the frequency characteristics of the transducer and therefore it can reproduce a very wide frequency spectrum (up to over 140kHz). When connected to the Luna Lure UMP-2, you can also play an independent signal from the second processing channel available on the player (or when using the Luna Lure UMP-2 as a USB-DAC computer interface). 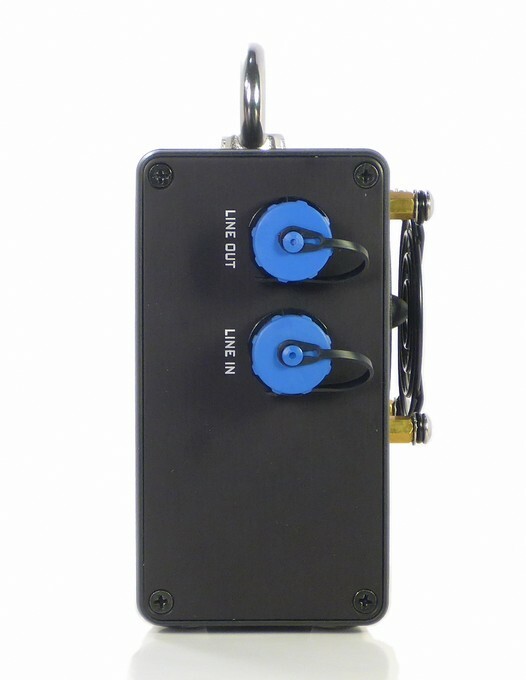 The Luna Speaker UMS-1 can also be connected to any audio or ultrasonic source (eg, players, sound cards, DAC or DAQ devices, etc.) via a suitable cable available as an option. Frequency range from about 1 kHz to over 140 kHz provides reproduction of acoustic signals (eg singing of most birds) and ultrasounds (all species of bats). 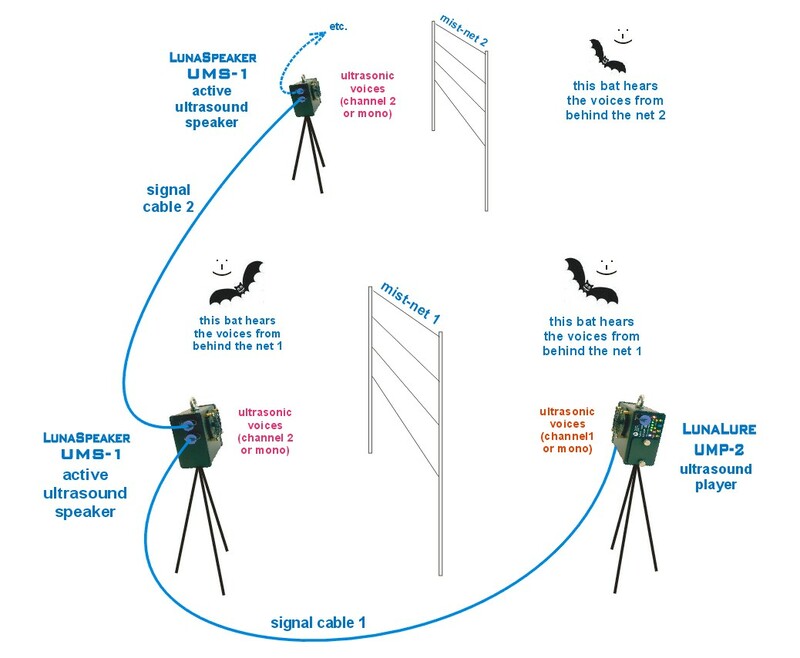 In addition to the LINE-IN signal on the side wall, an additional LINE-OUT output is also provided, which can be used to cascade additional equipment (Luna Lure or Luna Speaker). The output has the same signal level as the LINE-IN input, but is controlled from an internal buffer that provides low losses even in the long connection cable when transmitting the signal to the next device. 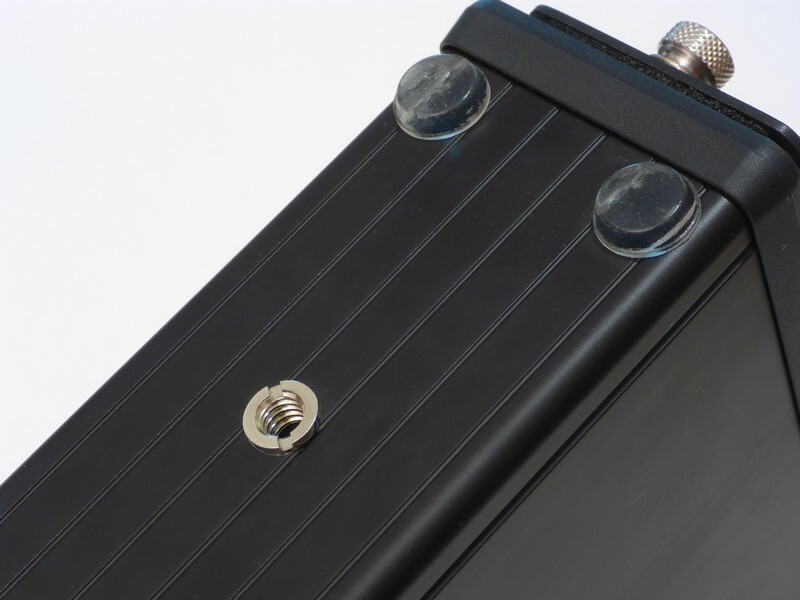 It can be powered from an external 9-15V power source (eg car battery or 12V AC adapter) or powered from 8 AA-size cells (primary batteries or Ni-MH accumulators) inserted inside (socket for detachable battery basket). The signal level at the output of the built-in amplifier signals a 5-point LED diode meter, plus an additional sixth red LED signaling the amplifier overload (for example, by providing too much signal from the source or setting too much gain), and may generate excessive distortion. Bats echolocation signals or other rapid pulse signals on a normal control signal could be left unnoticed; therefore, the “overdrive LED” is controlled from a separate circuit that provides illumination for at least 0.25 sec. even for very short distortions. There is also a 32-point output power regulator (VOLUME – / VOLUME +) on the panel below the power indicator, which is by default set at mid-range (-6dB in relation to the maximum setting) at power-up). The advantage of this configuration (active speaker with independent amplifier and power supply) compared to the passive speaker connected to the remote amplifier or other signal source with the current cable is significant – the active speaker does not load the signal source (it has its own independent internal or external power supply). The source has very low losses due to the high impedance of the LINE-IN input, so that possible resistance losses in the cable are negligibly small, virtually imperceptible. Impedance losses (due to cable length and capacity) are also small enough that virtually no signal loss can be transmitted with signals over 140 kHz to tens and even hundreds of meters. For comparison – when connecting a 4Ω impedance to the amplifier output even with a special low-loss cable with multiple insulated conductors, the loss in such a cable causes almost half the power of the amplifier is lost in the cable at 25-30m length. In addition, the higher the signal frequency, the higher the loss due to the electrical capacity of the cable. At the bottom of the housing is a reinforced tripod female socket with so-called: “small photo thread” (UNC 1/4” 20tpi) for mounting on a standard photo tripods or UM-1 / UM-2 rails. At the bottom of the housing there are also four flexible feets for stable positioning on flat surfaces, and a stainless steel eyelet for mounting on a branch is mounted on the upper wall. 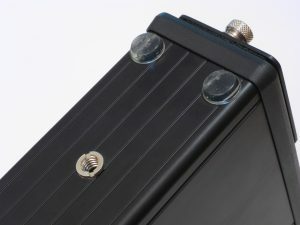 Newest unique function is displaying the level of supply voltage on LEDBAR in 3 seconds after powering the device, so the user can quickly determine whether batteries or accumulators have enough energy to work with the device. The mobile active ultrasound speaker Luna Speaker UMS-1 can be connected to a line output from an audio or ultrasonic signal source via a cable with a suitable connector. A USB-DAC interface (soon to be available), a DAQ card, a generator, or a computer sound card or audio player may be used. 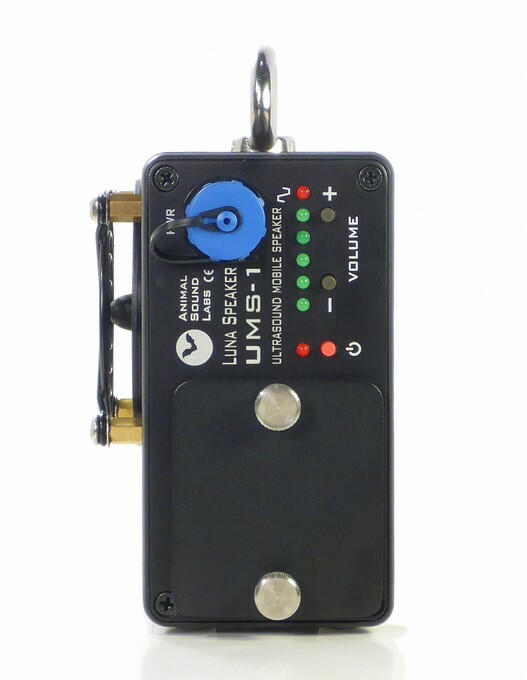 The standard set includes a 5m signal cable for connecting our Luna Lure UMP-1 or Luna Lure UMP-2 ultrasonic players. If you need to connect to other devices – you can purchase a cable with the appropriate plug as an optional accessory. Here is a description of the use of our active broadband speakers with the LunaLure UMP-2 player. 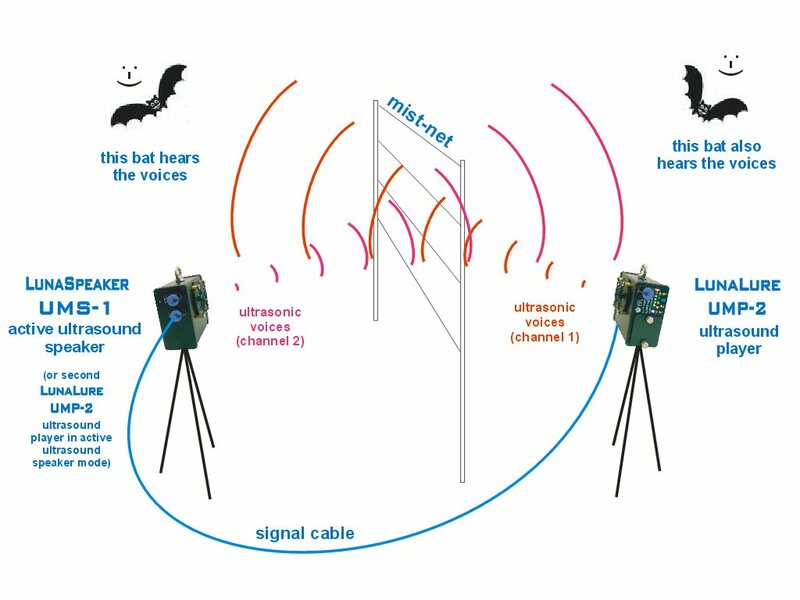 While the Luna Lure UMP-1 and Luna Lure UMP-2 devices makes possible to attract animals from one direction, the ability to connect an active speaker virtually doubles the range or coverage of terrain by audio or ultrasonic signals. The bat or bird (on the other side of the mist-net and in the axis of the speaker’s radiation of the player) hears the familiar voices and curious / lured tho them it flies closer to the signal source, but on the way falls into the mist-net. Because of the direction of sound and ultrasound radiation from the loudspeaker – their intensity rapidly decreases beyond the axis of the speaker’s radiation. In addition, the intensity decreases the faster, the greater is the frequency of the transmitted signal. 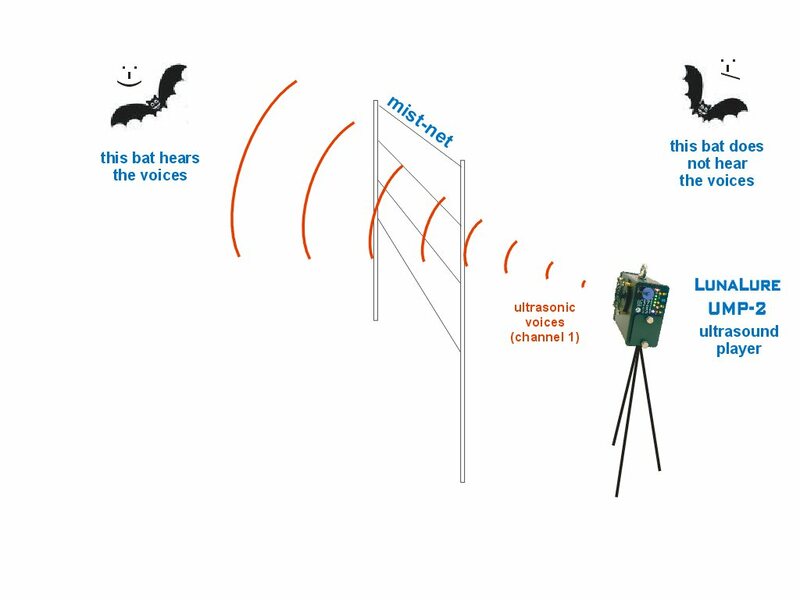 As a result, a bat outside of the speaker’s axis (or behind the speaker, on the same side of the net) will not hear the reproduced signal and will not be lured / caught in the net. A similar situation is with audio signals and although the directionality for audible sounds is less, the use of an additional active speaker also increases the range significantly. one-channel (mono)/ two-(or more)-speaker operation – all devices: the speaker in the LunaLure UMP-2 player and the speaker(s) in the active speaker(s) Luna Speaker UMS-1 are reproducing the same signal from the recording on the memory card. To get this kind of work – the recordings should be prepared in the editor beforehand. You need to create single channel / mono recordings (you can also use stereo / dual channel recordings, but it should have the same signal in both channels, for example, after mixing them with each other). This second mode of operation (mono) can be particularly useful when you need to increase the range of luring by placing the devices side by side at a short distance and pointing them in the same direction (the power of the radiated signals from the individual devices will add up). You can also direct the individual devices in different directions, thus reducing the directional effect of the loudspeakers. In this way, the width of the radiated ultrasound beam can be broadened. The implications of using such a solution are many. For example, you can drive off two (or more) remote locations using only one Luna Lure UMP-2 player and one (or more) Luna Speaker UMS-1 connected to it. At the same time, the connection of the active speakers is cascaded – the first connected active speaker is connected to the second active speaker, second to third etc. The total cost of such a solution is considerably lower than that of using separate playback devices for individual (not so remote) locations. 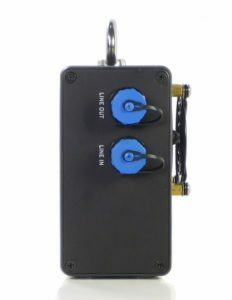 And because of the much lower price of active speaker (even with long signal cable) than the separate player this is the more cost effective solution as there are more points in the area where the catches are to be carried out. In the above example, the “mixed” configuration is also possible, ie the Luna Lure UMP-2 player reproduces channel 1 / right and the Luna Speaker UMS-1 active speakers reproduces channel 2 / left. The use of an active ultrasound speaker connected to a line-level source has the advantage (against the passive speakers in competing solutions) that the signal in low-current cable is not degraded (weakened and frequency-limited), as is the case with passive speaker connected via speaker cable. Thanks to this, the distribution of individual signal sources is not limited to a few meters. Losses in connection cables depend on many electrical parameters of the circuit, and most important is the ratio of cable impedance to impedance of the receiver / speaker (with the impedance of both components changing with frequency). For this reason, in the case of passive loudspeakers, already several meters of cable have large power losses, which are to be radiated by a speaker with a relatively low impedance (eg 4 ohm). When using a low-current signal cable, where the receiver has an incomparably higher impedance than the cable impedance, the signal can be transmitted at significant distances practically without loss (losses are imperceptibly small). This fact, as well as independent powering of the active speaker(s), causes longer operation of the whole system, without frequent battery replacement. Contact for more information about additional or standard accessories here or via mail: info@animalsoundlabs.pl ).